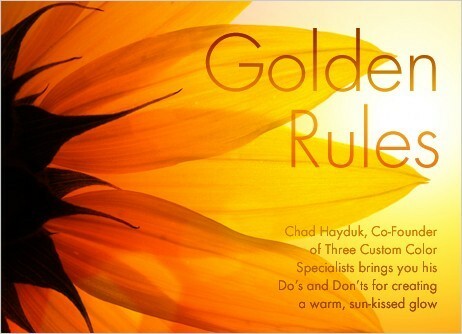 Chad Hayduk, Co-Founder of Three Custom Color Specialists brings you his Do’s & Don’ts for creating a warm, sun-kissed glow without the harmful effects of the sun. Wearing the wrong shade of bronzer can lead to orangey-looking results. Our finely milled Powder Bronzers are available in two shades, Cool for rosey-toned skin and Warm for golden-toned skin. Not sure if you are warm or cool? View our Warm v. Cool Chart to learn more. Bronzers look best when applied sparingly where the sun would naturally hit you. Use our fluffy Face Powder Brush to apply bronzer on the high points of the face – the forehead, nose, and cheeks. If you prefer a crème formulation for more control, use a sponge or your fingertips to apply Bronze Crème to Powder Blush (a sunny, shimmering bronze designed with Celebrity Makeup Artist Matin) and don’t forget to blend, blend, blend! Forget your neck (or your shoulders, or décolletage). High summer temperatures also mean we’re showing more skin, so don’t forget to add a little extra glow to balance out the look. Apply On Fire Shimmer Crème (a bronzed shimmer with a swirl of opalescence) with your fingertips to the neck, décolleté and shoulders. On Fire Shimmer Crème goes on light and silky, and can also be used to highlight and enhance the cheekbones. Finish your look with a bronzed gloss & a pop of color! A rich, beachy bronze with a glamorous mauve sparkle created for style maven Tia Williams, novelist and former beauty edtior. Our unique Cool version is especially formulated for rosey-toned skin, creating a healthy, fresh look without the damaging effects of the sun. Our Bronzers are smooth and silky with a delicate gold shimmer. Super Goat - This luxurious, full brush with the contoured head gives smooth, even powder application. Feels like the finest silk on the skin in the process. What a treat! A bronzed shimmer with a swirl of opalescence. Created with Dina Gregg. A festive sparkly teal flecked with glittering diamond like shimmer! Our Warm version is especially formulated for golden-toned skin, creating a healthy, fresh look without the damaging effects of the sun. Our Bronzers are smooth and silky with a delicate gold shimmer.